FAVOURITE PERFUMES | RAWR BOWS. Two or three years ago I used to have only one perfume that I really liked and use it only on special occasions like parties, dinners, etc. Fast-forward a few years and I am incapable of leaving the house without any sort of perfume or body mist. I kid you not, I can’t even go to Tesco. Currently, I have three that are my go to scents when I’m leaving the house (I swear, I do go outside… some days). I try to use body mists, which are generally more affordable, for my everyday scent as I don’t want my expensive perfumes to run out too quickly. At the moment, my favourite body mist is Hollister’s Crescent Bay. I have had this one for probably two years so I am not too sure they still have it as I know they’ve changed the packaging recently, and they might have changed the scents as well. 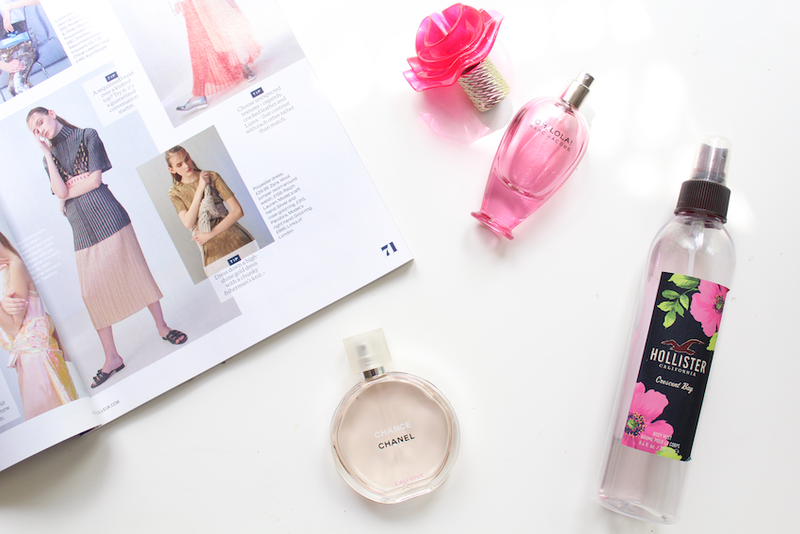 It smells very fresh and girly, and it’s very subtle so it’s perfect for spring and summer. Next, we have my most recent favourite Chanel Chance Eau Vive. I had been lusting over this Chanel perfume for so long and I eventually got it for Christmas! I love how simple, yet sleek, the bottle is. This one is a bit more sophisticated, it has a stronger scent. It also smells very fresh - jasmine with a hint of citrus. Finally we have a perfume that I didn’t really like that much when I first got it. A while ago, I got obsessed with Marc Jacobs’ Daisy. Two of my friends had it and I literally loved it, and it’s all I wanted in life. I can’t remember the exact reason why I ended up getting Oh, Lola! Instead but I think it was because I was having a hard time finding Daisy. Anyway, I now love this perfume and, as you can see, is pretty much empty. I probably have one or two uses left but I can’t bring myself to finish the bottle. Again, it has a sweet and fruity scent (I think there is a clear pattern here). It smells like a mixture of peonies, vanilla and pear - a gorgeous combination!